Truck lovers will feel as if their dreams have come true when they encounter the 2016 Ford F-150. I would usually tend to disagree with such a statement, but this new F-150 leaves little to desire. With its enhanced Sync 3 infotainment capabilities and more fuel efficient engine, the new F-150 is the epitome of a truck lover’s dream. It matches all of its standard expectations and more for the performance of a pickup truck to right along with all of the bells and whistles that many truck enthusiasts have come to expect as the norm in lightweight/ light duty pickup trucks. 2016 saw the MyFord system replaced with the Sync 3 infotainment system. When Ford uses the word infotainment, the name basically combines the best of both worlds of technology usage: information and entertainment. The system can allow you to play music or map out a route with the in-dash digital interface and any Blue Tooth enabled mobile device. Truck lovers want more bang for their buck, especially under the hood. The 2.7-liter EcoBoost V-6 packs a powerful punch. At a slight upgrade under $800, the twin turbocharged engine delivers on those dreams. Although Ford keeps a V-8 in the lineup, the turbo V-6 is well worth the upgrade from the base model V-6. At 19 MPG in the city and 26 MPG on the highway, the turbo V-6 is the most fuel efficient engine selection of the truck's various engine choices. 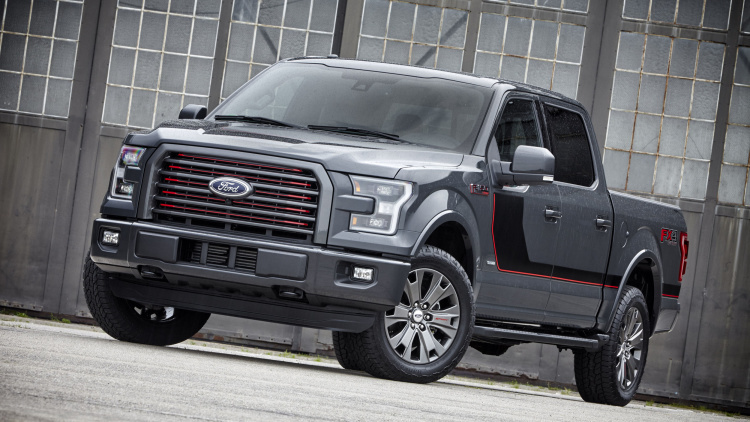 If you’re thinking about new truck, give 2016 Ford F-150 a try. Test drive one today at the Olympia Auto Mall.